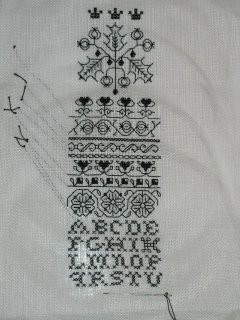 This is my project from my Blackwork class on Saturday. The teacher is a member of my EGA chapter, she was a bit unsure on the accuracy of the directions so she had a group of us over as a test class to have us stitch the piece and see if there were other errors she had missed in the charts. I am almost halfway done right now and its been pretty good, only a few small things, definitely not something for someone with no clue how to do blackwork to take up as a couple of them weren't so easy to catch. I hopefully will have this done this week so I can get back to her with anything else I might find, then the matter will be in the finishing. I was actually thinking this would look fabulous as a bell pull, no frame at all. This is my first true blackwork piece even though there has been a lot of it in the Indigo Rose pieces I've done. And for the most part this one is reversible with a few exceptions for things like the alphabet and the queen stitches. Oh that's lovely, I just love blackwork. This piece looks awesome! You are definitely inspiring me to take up blackwork! Your blackwork is fantastic! Reversible? Wonderful! I look forward to seeing the back. Oh it's soooo pretty! I love it!